Nanded Municipal corporation (Mahanagar Palika) election results 2017 (NWCMC elections 2017) were announced beginning from 10 am scheduled for today date, we will keep you up with the Nanded election live news as it unfolds. The Poll for 81 seats for the Nanded Waghala Municipal Corporation were held on Wednesday. 578 candidates are currently in the poll competition and we’ll be updating as the results continue to come. Congress clearly looks the winner leading in 17 wards and have won in 49 wards ( Total 66 ) , whereas Shiv Sena is stuck on 1 and BJP leading on 5 wards. 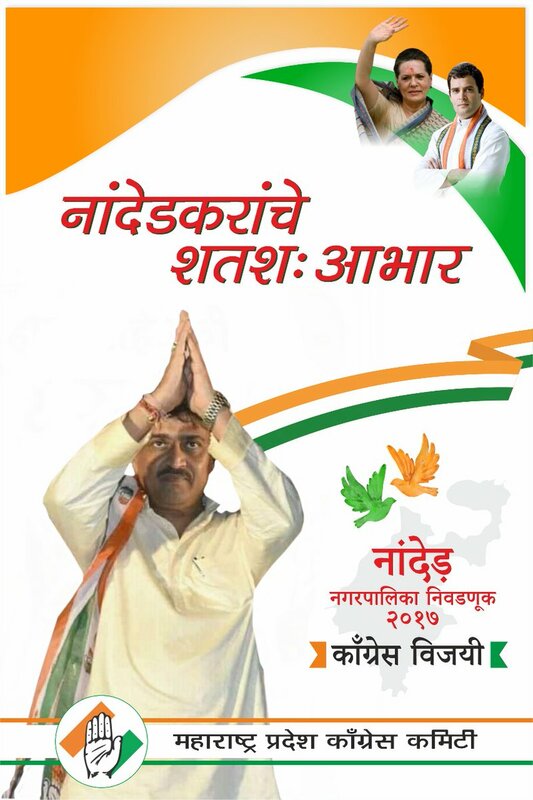 Nanded Waghala Municipal Corporation is working under Congress currently, after it won 41 wards in 2012. Shiv Sena had come second with a meager 12 seats and Asaduddin Owaisi’s All India Majlis-e-Muslimeen (AIMIM) was a close third with 11 seats. The counting is still under way, but this is the first time that the election authorities used a paper trail in Nanded. 5:35 PM IST Congress win confirmed for 49 of 54 declared result out of 81. 1:24 PM IST Congress leading on 37 seats, BJP 4. 1:10 PM IST Congress candidates and members begin celebrating as they reach halfway mark victory. 12:52 PM IST Congress has 36 seats and BJP 2. 12:41 PM IST Congress wins 16 seats and BJP 1. 12:37 PM IST Congress ahead by 31 seats, BJP has won 1. 12:20 PM IST Congress wins 8 seats, leading with 20. Shiv Sena has gained 2 seats. BJP and AIMIM have 0. 12:12 PM IST Victorious Congress candidates in 11 wards are Syed Sher Ali, Aasiya Begum, Abdul Habib, Raziya Begum, Masood Ahmad Khan. 12:02 PM IST 8 congress candidates win. 11:41 AM IST All congress candidates win in 11 ward. 11:39 AM IST Congress wins 4 seats, leading at 23 seats. AIMIM has lost. 3 BJP candidates in ward 11. 11:30 AM IST Congress leads with 23 seats, BJP has 1 and Shiv Sena has 2 seats. 11:27 AM IST Latest update, Congress leads with 20 seats while BJP and Shiv Sena have 1 each. 11:20 AM IST Congress leads by 20 seats. BJP has 2. 11:11 AM IST Congress ahead by 18 seats, BJP gains 4 seats. 11:O8 AM IST Congress still at 18 seats, BJP now has 3 seats. 11:01 AM IST Congress is leading with 18 seats, BJP has 2 seats.